Editor’s Note: As is noted in the Summer 2010 Concordia Journal we remember here the passing of the Reverend Doctor Quentin F. Wesselschmidt, pastor of the church, professor of historical theology, scholar of early church history, and editor (actually, “chairman of the editorial committee”) of Concordia Journal for 25 years, by far the journal’s longest tenured editor to date. Below is the encomium that was delivered by William Schumacher, Dean of Theological Research and Publication, on May 20, 2009, upon Dr. Wesselschmidt’s retirement, along with five of his esteemed colleagues. I have the honor of saying a few words to recognize and salute the career of service of my colleague, Quentin F. Wesselschmidt, who unfortunately is not able to be with us today. Quentin studied theology at St. Paul’s College in Concordia, Missouri; at Concordia Senior College; and here at Concordia Seminary, where he earned his M.Div. degree in 1963. His further studies took him to Marquette University (M.A. 1969) and the University of Iowa (Ph.D. 1979). His first call was into parish ministry, at Our Savior Lutheran Church in Hillsboro, Illinois. But in 1965 he was called to serve in the classroom, where our Lord has used him ever since: Concordia College, Milwaukee; Milwaukee Lutheran High School; stints as a teaching assistant at the University of Iowa and as a lecturer at the University of Wisconsin, Milwaukee. In 1977 he was called to this faculty, where he has taught in the area of historical theology, including something like 14 years as chairman of the department. All of us who studied here in the last thirty years have known him as our teacher. A few of us have been privileged to know him also as a colleague. Quentin guided and oversaw the Concordia Journal as chairman of the editorial committee for 25 years. The sheer magnitude of his service is impressive. With Dr. Wesselschmidt at the helm, the Concordia Journal published more than 400 articles and 1,200 book reviews—a grand total in excess of 10,000 pages. He has always exercised this leadership with competence, consistent diligence, Christian humility, attention to detail, and cordial collegiality. He made the task look easy—and I can testify emphatically that it is not. It is the fate of editors that their own scholarship must take a back seat to the publication of others, yet we are pleased to note that Dr. Wesselschmidt’s volume on Psalms 51-150 in The Ancient Christian Commentary on Scripture series (InterVarsity Press) was celebrated among our faculty publications recently. And we hope that his retirement may offer him further opportunities for his own writing. A couple of years ago I was in Cameroon, West Africa, to meet with Lutheran church leaders involved in theological education. Their church body has not had a historic relationship with the LCMS, and to the best of my knowledge no one from our Synod (let alone Concordia Seminary) had ever visited there before. 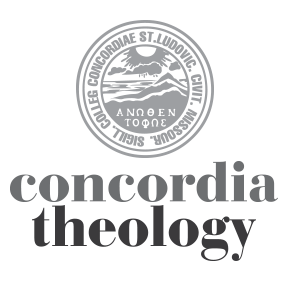 But in a sense, they knew us—they knew Quentin—since the Concordia Journal is regularly received and eagerly read at their seminary, where it constitutes an important resource in their theological library. I am happy to acknowledge and celebrate Quentin’s important role in making the Concordia Journal such a significant part of the public face of our Seminary and our Synod, here at home and around the world. His influence as both a teacher and an editor is lasting, and far wider than he might imagine. Dale Meyer on a pastoral shortage and the future of the church...from the Summer 2017 CONCORDIA JOURNAL. Amen. Dr. Wesselschmidt was on the review committee when I defended my MAP. He and Dr. Brauer were both incapacitated due to illnesses, and Dr. Wesselschmidt had recently lost his mother. Despite this, both Brauer and Wesselschmidt reviewed my work along with the rest of the committee present, the former two via teleconferencing. Such dedication to students never surprised me, and I never forgot that. Such service to build up the body of Christ by such servants of Christ is what Concordia Seminary is about. God be praised. I’m a bit late to find this, but I was grieved at the loss of Dr. W. He was my STM advisor and friend, the preacher at my ordination, and the supervisor of my special project to translate Jerome from the latin.